Yesterday I went to check up on the Mid Rachov (city center) hafatza - mainly Shimshoni and Gili, and I didn't see them so I went looking for a store but I took a wrong turn and couldn't find it, but I realized the hashgucha (Divine Providence) right away when I bumped into some great breakdancing that was going down. B"H yours truly took part, and B"H will post some footage - thanks to our newly wed friend Noach Mendelson, unfortunately he wasn't there to film my second performance which was much better especially since the breakdancers joined in, in middle of my dancing I was kind of shocked when I realized that someone was doing some type of spin mid-air inbetween my legs, which was mamash the power of Rabbainu, because the whole time each of the breakdancers performed completely alone. When I finished with the dancing I returned to find my friends in full swing hafatza, they told me that the reason that they were late was because they had been with Baroz doing hafatza in Moshav Germania - while being filmed by a German TV crew. They said that in middle a whole school of Bnei Akiva joined the dancing and fun. Earlier I met a friend who was unfortunately doing hafatza for a MFSS, but B"H he was trying to get into Nanach, he told me how he had enjoyed watching the video of the childrens writing Nanach by the Western Wall. It's amazing how one Nanach said or written can really help people everywhere! B"H most of the newly published Nanach magnets have already been distributed - with about 2000 enroute to Montreal. 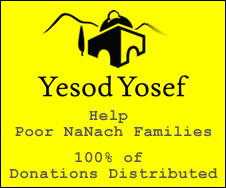 B"H in the near future we will be publishing thousands of Nanach stickers. Special thanks to all the generous contributers who have halped make this amazing hafatza possible. Simcha - its "MSS" not "MFSS"
PS: BTW who was the one who you said in a different post that you followed for approx 2 years ... was it the Kom....?